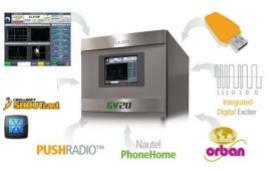 The GV Series is the culmination of years of Nautel digital/analog transmission innovation. 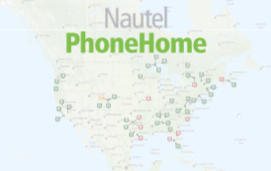 Nautel’s field-proven, high-power FM architecture is infused with the industry’s most advanced RF technologies and Nautel’s award-winning control system to set a new standard for digital performance, efficiency, serviceability and unmatched functionality. The GV Series represents the culmination of years of Nautel transmission innovation. These new designs incorporate everything you have come to expect from a Nautel digital/analog transmitter. 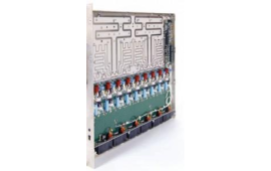 Engineered using Nautel’s field- proven binary combined high-power architecture, they offer the industry’s highest digital power outputs, commercial-grade instrumentation, advanced intelligent features and award-winning control via Nautel’s AUI. 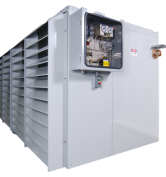 All of this capability is packaged in thoughtful uncluttered designs that allow easy access for maintenance. Broadcasters worldwide have installed over 2,000 of these reliable systems based on Nautel’s high power architecture and serve the globe’s largest and most successful stations. The GV Series extends that legacy and charts new territory with even more digital power, new achievements in digital efficiency and significant new instrumentation and functionality. For the first time ever, Orban’s signature processing is integrated directly into a transmitter via an economical plug-in DSP card. 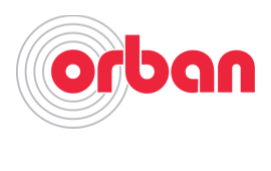 At about half the cost of a standalone processor Orban Inside™ incorporates many features of Orban’s Optimod 5500 Series digital processor with 5 band processor and dual band window-gated AGC. Orban Inside accommodates L+R, AES/EBU, SHOUTcast and USB player inputs. 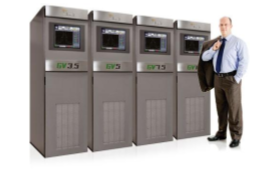 The GV Series offers affordable, high-power, solid-state with outputs up to 88 kW. That means more power for digital and more power for increased IBOC injection levels. 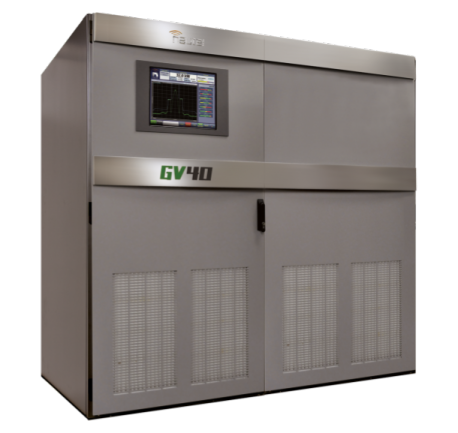 Unlike traditional high-power solutions the GV Series eliminates single points of failures. Your GV can lose fans, power supplies, power amplifiers, whole power modules, even its user interface and stay on the air. Its simple air cooling also makes the GV’s high power easy to deploy. Traditional designs put features and display capabilities into a very expensive external exciter rather than the transmitter. If you want exciter redundancy you need to purchase two of these expensive devices and end up with two displays. Nautel high power design puts all control functionality right inside the transmitter where it can provide the most benefit. A generous sized touch screen is provided locally and the same advanced control can be accessed anywhere on the web. 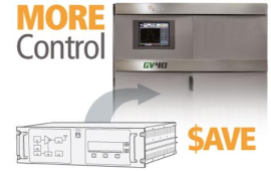 GV Series transmitters also provide an additional LCD display on the control module for extra control redundancy. 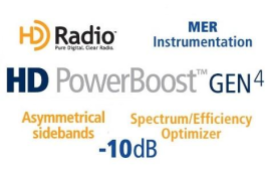 By eliminating outboard exciters you save money, gain even more advanced features and acheive centralized control over all transmitter functions including the exciter(s). In fact the exciters are so cost effective that many customers buy two. 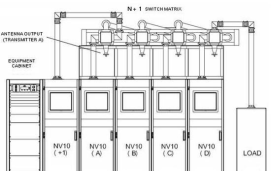 With the GV Series Nautel has charted new ground for digital transmission efficiency. 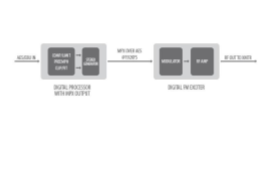 Traditionally, digital hybrid modes have displayed much lower efficiency compared to analog-only broadcasting. The GV addresses the need for analog/digital hybrid efficiency as well. 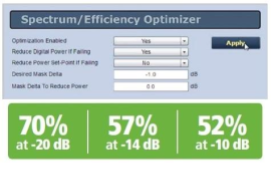 A new Spectrum/Efficiency Optimizer dynamically optimizes digital transmission parameters to achieve optimum spectral performance and efficiency. Digital efficiencies have improved by up to 15%. 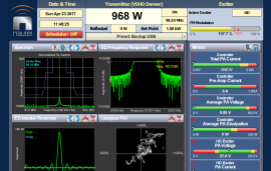 High digital efficiency can result in tens of thousands of dollars savings over the life of your transmitter. Whether you intend to broadcast digitally now or in the future your GV Series will be ready. While most transmitter designs have been adapted to address the digital broadcasting era, Nautel engineers started fresh to ensure the GV Series would offer the best possible digital radio performance. 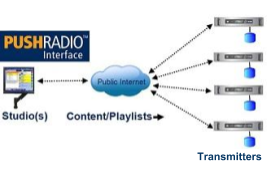 The transmitter supports adaptive pre-correction, MPX over AES, and even accepts I&Q directly to permit a plug-in HD Radio® Exgine. 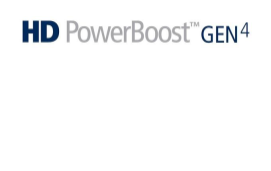 To meet the toughest demands for digital power and coverage, Nautel invented HD PowerBoost™ GEN4 and was the first to offer Asymmetrical sidebands. You’ll ensure optimal performance by utilizing the built-in MER instrumentation and Spectrum/Efficiency Optimizer. Like every Nautel ever built the GV Series incorporates solid state components in rugged, highly redundant, hot swap architecture. Common modules across the family minimize spares requirements. Compact footprints, published parts lists and screw driver replaceable power FETS make living with your GV transmitter easy for years to come. 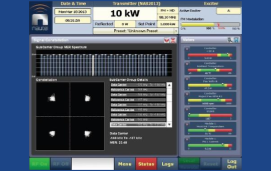 Nautel provides instrumentation for real-time measurement of MER (Modulation Error Ratio). The measurements follow the NRSC standards for measurement, and require no external equipment. 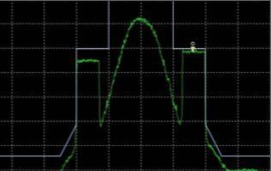 Real-time MER lets you diagnose issues such as interference with the MP3 carriers near the analog signal due to FM analog signal over-modulation. Nautel includes its award-winning asymmetrical HD Radio® transmission capability FREE with all new HD-equipped transmitters. 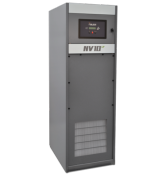 Using existing parallel inputs and outputs, the GV Series offers built-in, fully integrated monitoring and control instrumentation for site-related equipment via Nautel’s award-winning AUI; e.g. air conditioning and generator status. The AUI can also notify broadcasters via email if any monitored parameters transition to their fault state. 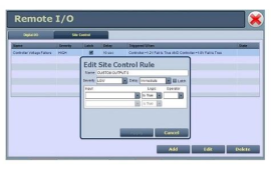 Using the AUI’s intuitive Site Control menu, users can also develop more complex logical expressions involving pre-existing or custom remote inputs and outputs. These expressions can drive physical remote outputs to control the operational state of other site equipment; e.g. to open a building vent if the air-conditioner fails. Delays and latching functions are also available for each expression, along with visibility of the current state, notifications and logging via the AUI.